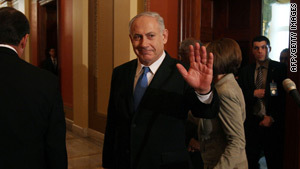 Israeli Prime Minister Benjamin Netanyahu met with Barack Obama on Tuesday. (CNN) -- First the United States blew its top at Israel. Secretary of State Hillary Clinton called it insulting to the United States earlier this month that the Jewish state announced new construction on disputed land while Vice President Joe Biden was visiting. Not only did the Israeli declaration seem designed to torpedo indirect peace talks with the Palestinians, which the United States had just painstakingly arranged, but it came during a trip by the highest-ranking member of the Obama administration yet to visit the country. Then the United Kingdom lost patience with Israel, expelling a diplomat after a British investigation concluded that the Jewish state had almost certainly faked British passports as part of a plot to kill a Hamas weapons merchant. British Foreign Secretary David Miliband on Tuesday called the apparent forgery intolerable, saying that such a move coming from an ally "only adds insult to injury." Its diplomats, from the foreign minister on down, said they regretted London's move. But there was little indication Israel would respond in kind. Despite the toe-to-toe standoff with the United States, Prime Minister Benjamin Netanyahu had dinner with Biden in Washington and met President Barack Obama, though he fiercely reiterated Israel's right to build on land claimed by the Palestinians while he was in the United States. It's all part of a calculated game for Netanyahu, according to Asher Arian, a senior fellow of the Israel Democracy Center. The prime minister has a lot of constituencies to please -- and Washington and London are not on the top of his list, Arian said. "After all, Bibi is relatively popular, Obama is not," in Israel, he said, using the prime minister's nickname. This also is a good time for Netanyahu to test the limits with the administration in Washington, he added, because both the U.S. and Israeli governments are early in their terms. "You could make a case that the time to force a mini-crisis is now, before the stakes are at their highest," he said. "They face a long three years together. "You can think of this as a stage in the bargaining. He's setting his image, his stance," said Arian, who is also a distinguished professor at the graduate center of the City University of New York. Being able to accuse his coalition partners of blundering can also work to his domestic political advantage, Arian added. "Being able to blame [Foreign Minister Avigdor] Lieberman or [Interior Minister] Eli Yishai does not weaken him either," he said. Washington understands the game Netanyahu is playing, Arian said, but that does not mean its anger is just for show. "All of it is for real, and I bet there is a lot more there. They are muzzling themselves," said Arian. The criticism from the United States has made it easier for other countries to condemn Israel, said analyst Mark Heller. "I am guessing [it] somehow opens the floodgates because people might sense that if the U.S. appears to be distancing itself a little bit, then it's open season," he said. "It's easier [for other allies] to act on what might be their natural tendency anyway." That "natural tendency" includes a willingness to criticize Netanyahu in particular, said Heller, of Israel's Institute for National Security Studies. "Israeli rhetoric has changed, but Israeli actions haven't changed," he said. "Things that people might have been willing to look the other way about under a different Israeli government draw a sharper response under this government," he said. A former Israeli ambassador to the UK went even further, calling Britain's actions hypocritical. Not only was London acting without Israel's having confirmed it was behind the killing of key Hamas figure Mahmoud al-Mabhouh in the United Arab Emirates in January, but the victim also was no angel, said Yoav Biran. "We are not talking about the killing of a righteous gentleman. We are talking about an arch-terrorist cooperating on behalf of Hamas with Iran. His job was to provide ammunition, weapons and explosives to Hamas, who used it against innocent civilians," he said. "Britain, too often, exercises double standards. They show much sympathy and understanding to their [own] behavior and their actions, while criticizing similar actions by some of their friends, notably Israel. And this I can't accept," he told CNN's Paula Hancocks. The mayor of Jerusalem said Israel did take allies' views on board, but didn't let them run Israeli policy. "Of course we take them into account. It's very important to understand other people's views. It doesn't necessarily mean that we have to agree on everything. You know, even in marriage, you don't always agree on everything, but you learn to respect different views," said Nir Barkat. "We will not freeze building in the city of Jerusalem as part of the negotiations" with the Palestinians, he said. If that means sacrificing the good will of the United States, he said, "I believe that's a price Israelis and myself are willing to pay." CNN's Guy Azriel and Jo Shelley contributed to this report.